Netvizz is a tool that extracts data from the Facebook platform. File outputs can be easily analyzed in standard software. You need to have an Facebook account. If no ? create an account go to http://www.facebook.fr. After login on Facebook, go to the search bar (on the top), write "Netvizz" and click on. 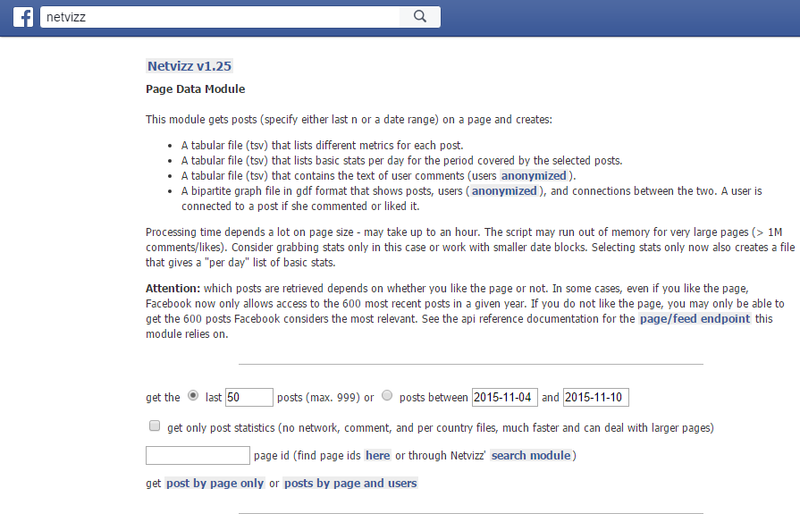 Select "page data" for collecting Facebook Fan Page data. Specify the number of posts or date range you want. Enter the page ID ( for get the page id enter your Facebook Fan page URL here https://lookup-id.com/. Select the get method "posts by page and users". 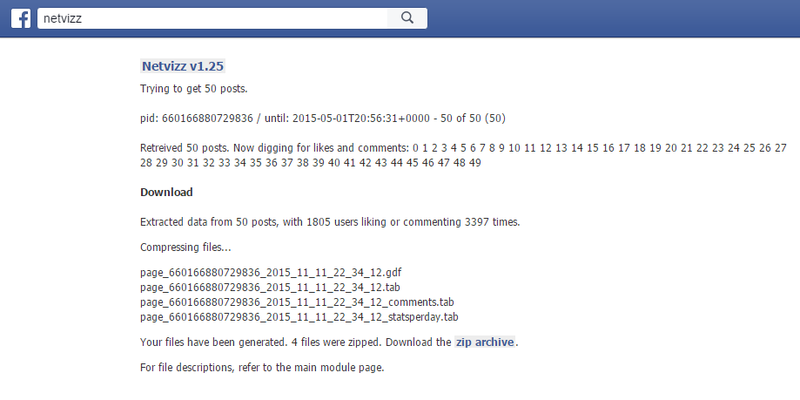 Wait during the data extraction, big Fan page can take some time to process (minutes or hours). Be patient and try not to reload! After decompressing of the zip archive. A tabular file that lists different metrics for each post. A tabular file that lists basic stats per day for the period covered by the selected posts. A tabular file that contains the text of user comments (users anonymized). A bipartite graph file in gdf format that shows posts, users (anonymized), and connections between the two. A user is connected to a post if she commented or liked it. Open the file containing the GDF format with Gephi. The files containing the TAB format can be storage into a data-warehouse for exemple.